New technologies are blurring the boundaries between the real and the virtual world. The brain can control a machine, and even perceive it as its own body. Can that improve our lives? At Barcelona University, scientists are working on a European Research Project to link a human brain to a robot using skin electrodes and video goggles so that the user feels they are actually in the android body wherever it is in the world. The electrodes measure brain impulses enabling a person to control the robot’s actions without moving their own limbs. The idea is to enable severely disabled people to enter the world via a real-life avatar. Using a remote avatar, anyone can travel without leaving home. But to make the experience feel more realistic, several senses need to work together. In a laboratory in Pisa, scientists are testing a chair that vibrates in time with 3D video playback, recreating some of the physical aspects of walking. 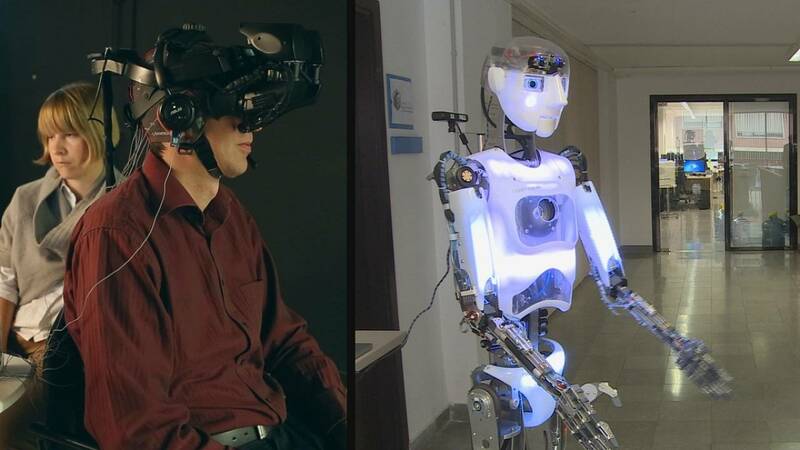 An even deeper immersion into the virtual world becomes possible with robotic exoskeletons that simulate physical interactions, and with advanced 3D projection systems. Touching virtual objects, feeling their texture and weight, will make the digital world more natural and easier to live in. But what if virtual models could change the real world, making it more accessible? That’s the goal of another European project involving hundreds of diabled people in several countries. Scientists use cameras and sensors to study how physically impaired people move, getting a better idea of their average physical limitations. The data is used to simulate how motor-impaired people cope with various tasks – such as opening the glove compartment in a car. With these models, industrial designers will know in advance how safe and convenient their new products are, and can adapt them better for users with physical limitations. Seeing the screen through the eyes of someone with advanced glaucoma, using the mouse as a person with tremors… makes it easier to understand other people’s physical challenges, helping us move towards a world without limits.